With so many different makes and models of boilers, furnaces and air conditioning systems available on the market today, it’s difficult to find an HVAC contractor experienced enough to know how to handle and resolve any problem you may be having with your heating or air conditioning system. You need an HVAC contractor with experience – that’s why you can count on Family Danz. 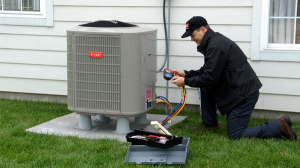 With more than 30 years of experience, our highly trained HVAC specialists are capable of maintaining and repairing any type of heating or air conditioning system for you, and installing a wide variety of HVAC equipment brands and types. Even our skilled commercial HVAC professionals will quickly be able to diagnose and troubleshoot any repair needed on your system. We are more than just an HVAC contractor. Besides HVAC repair and installation, Family Danz also provides home heating oil for customers in the Albany, Schenectady and Saratoga, NY region. Our home heating oil prices are guaranteed to be the lowest. We have remarkable service that you can depend on, helping you to live worry-free. Let us help you with your next HVAC project, whether you need maintenance, repair or installation. Even if you just have a question on how you can use less energy in your home and save on utility bills, we have the answers you need. Call us today! Family Danz proudly serves Albany, Schenectady, Saratoga and all of the surrounding areas. See below for a list of the many areas in which we regularly provide heating and air conditioning services.